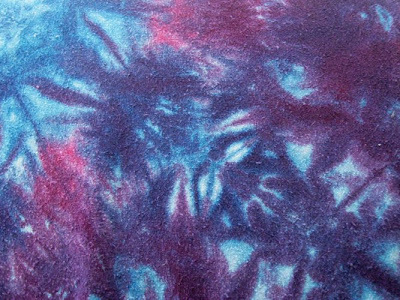 I just posted several pieces of hand dyed fabric on my sales blog...and I'll be posting more in the coming days as they are available. Generally I have fat quarters and half yards, plus a few smaller pieces priced accordingly. 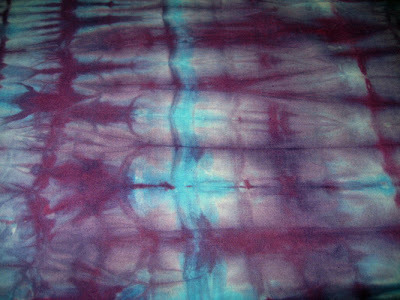 Some are low water immersion dyed, some shiboried, some both, and more. Each piece unique and not exactly reproduceable. 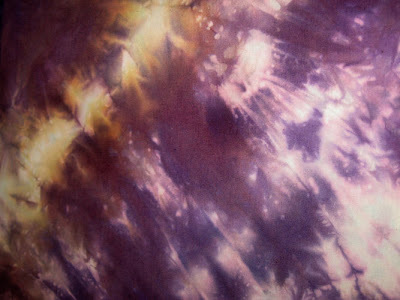 But that's the beauty of hand dyed fabric, isn't it?! 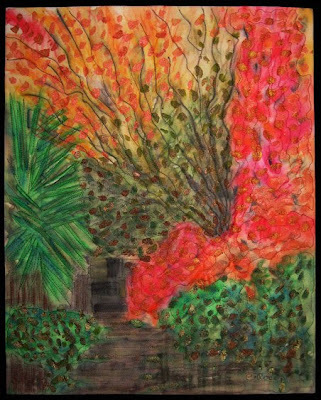 Here's my second interpretation of a photo taken on Bellagio, Lake Como, in late 2007. This new piece is called Looking Back, and it is 20x16 inches. See the first quilt and the photo here. I totally love this new quilt, which brings together several techniques I've wanted to try, in one place. 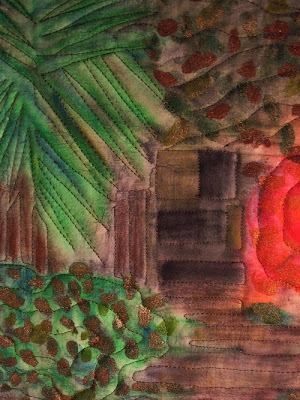 First off, it is wholecloth -- one piece of fabric rather than pieced in any way -- and as such, is a piece of muslin that I "painted" with Caran d'ache Neocolor II watercolor crayons. 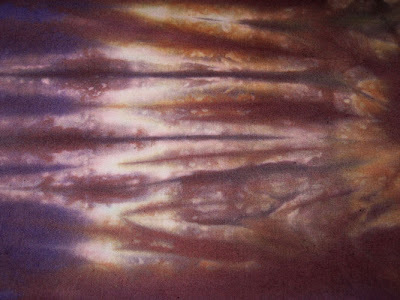 Actually, I drew the scene with the crayons, then added water, and it became a watercolor painting on fabric. 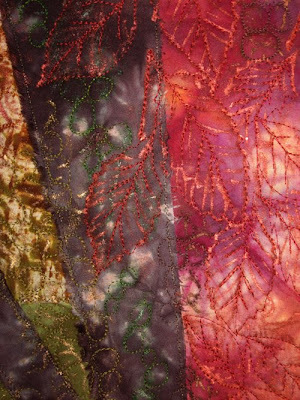 After the fabric was dry and ironed to set the colors, I layered it with backing and batting, basted and then quilted it. The quilting is different for me, in that there's a lot less of it than there was on the first piece earlier this month. 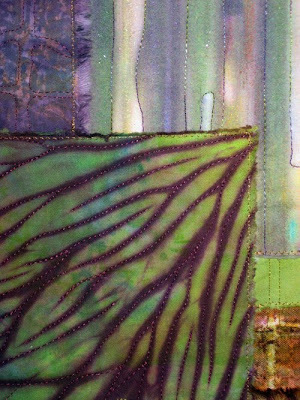 And I also quilted the color areas in a more general sense than I usually do, paying less attention to detail. 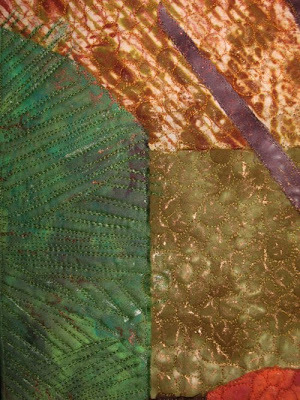 When it was all quilted, yesterday, I dabbed on metallic textile paints to give the impression of leaves, throughout. I used Lumiere, Setacolor Shimmers and Golden Fluid Acrylics. I love the painterly quality of this piece, and so glad I finally experimented with painting the wholecloth and then quilting it. 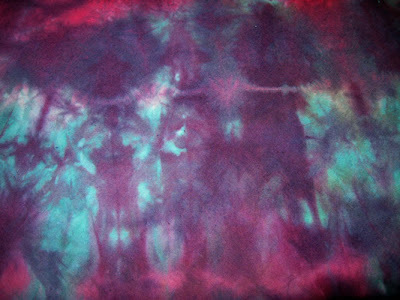 I tried another dyeing experiment yesterday. 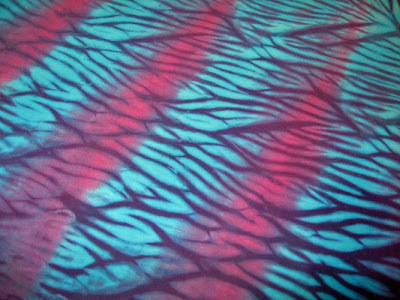 I made a few changes to my "normal" shibori process, wherein I put a bunch of tied, wrapped, clamped and/or scrunched fabrics in 2 gal. of water with 3-4 T of dissolved dye. Normally I'll let it steep for 15 minutes, than agitate the dye with my gloved hands, add soda ash, and let sit for another hour with agitations every 15 minutes. After an hour in soda ash, I decant the bucket, rinse the fabrics in cold water, and wash in hot water with synthrapol. What I did differently yesterday was this: I used two colors of dye -- black and teal -- I let the fabric steep in the dye for an hour, then I agitated, added soda ash, and left the bucket to batch overnight. I was hoping the dye colors would separate into their component parts, instead I got more of a bluish black with minor separation. It kind of looked like indigo, in the end. The only two pieces of fabric above that were white when I began yesterday are the second and third pieces from the left. 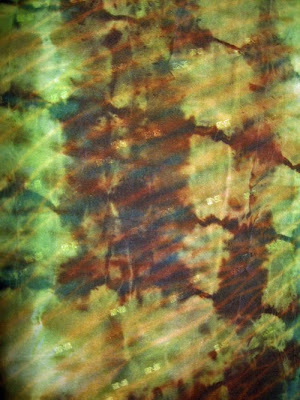 Everything else had been low water or shibori dyed previously. Except for the bluish purple piece on the right, which I had painted with Dynaflow the other day. I really like Dynaflow -- it's like dye, only it's paint! I completed my second photo quilt for February, today, and I'll upload it tomorrow. I'm really happy with it -- everything about it is different from what I've done before. Can't wait for you to see it! Beverly, in Utah, is the winner of Rock On! Thanks to everyone for their wonderful comments, and for participating in the drawing. And many thanks for your loyal readership for two years! Sometime today or tomorrow, one of you will be the 50,000th reader on this blog, which I began just two years ago. I'm giving away this quilt to whichever one of you will be that person. So if you'd like to receive the quilt, leave a comment sometime today or tomorrow. I'll do the math. 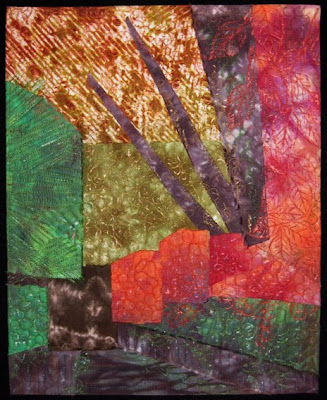 The quilt, Rock On!, was part of 2009's weekly quilt series. It is 10x10" and comes with fabric corners on back and a dowel to hang with. The digital image is from my favorite beach on the North Coast, Luffenholtz Beach in Trinidad, about 20 miles north of Eureka. Post a comment and maybe you'll be the lucky winner! Have a great Sunday, too. 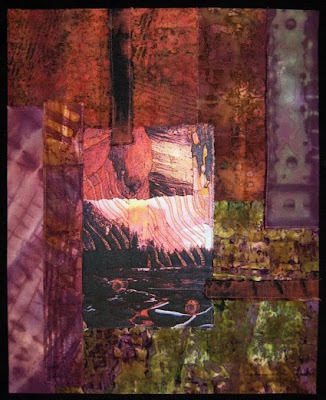 This here is my second collage quilt for February, called Late Afternoon, and the inspiration for it, just below. 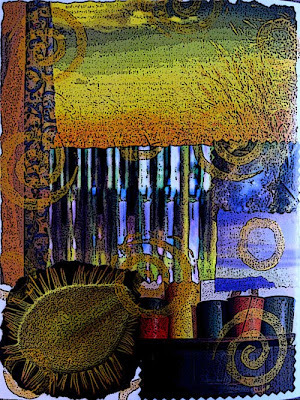 The central image in both quilt and collage is a recolored photo I took a couple years ago, a reflection on and through corrugated glass. 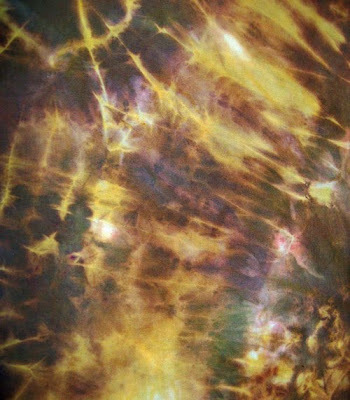 One of my favorite images, that actually appeared in an earlier quilt as well. That unusual thing at the lower left in the photo collage is a seed of some sort, highly magnified. Looks like some kind of critter but it's part of the plant kingdom. Today was my birthday. I've had a really wonderful day, not doing anything particularly special, but enjoying myself and all the well wishes I received throughout the day -- most from online friends. What a wonderful way we have to be connected with each other -- blogging and Facebook -- I'm loving it! 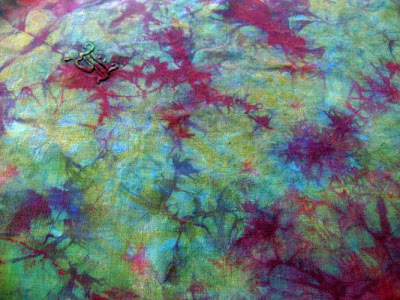 A few days ago I did a small batch of discharging, mostly on previously hand dyed fabrics that I wasn't happy with. I used thiox for the discharge, and I purposely took the fabrics out after just a few minutes in the bath. I wanted to tone down the colors and bring out some hidden colors, rather than remove all the color on the exposed areas. This morning I finished my second collage quilt for February, will upload that tomorrow. 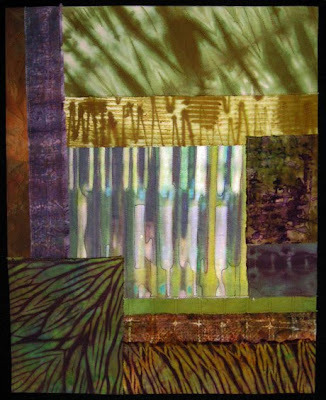 I've mentioned several times recently that I wanted to do more abstract work with art quilts, and this is a new piece that I would put in that category. It's called Night Music, and it's 14x11 inches. And being a real fan of challenges, I've added monthly Abstract Art Quilts to my list for this year. A word about challenges -- it's often said in the marketing domain that people respond to deals and deadlines. 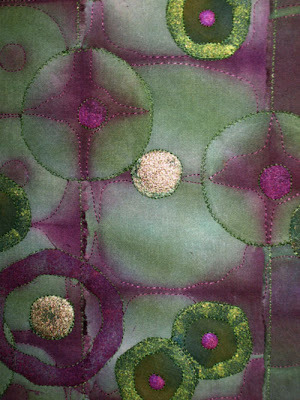 Creating quilting challenges for myself focuses my work and moves me along in the directions I want to explore. If you're overwhelmed with options, uncertain about direction or what you want to say, or you want to try new things, I highly recommend creating art challenges for yourself. Actually, most of my work is abstract. Here's Wikipedia's definition of Abstract Art: Abstract art uses a visual language of form, color and line to create a composition which may exist with a degree of independence from visual references in the world. I would agree that most of my quilts have little, if any reference, to the actual world. 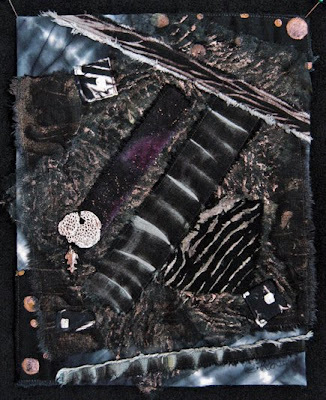 is a collage of fabrics and other elements not related to a preexisting image or photo or view of "reality"
I'm sure there's even more to this abstract thing. I've just begun trying to articulate the concept in "concrete" terms, getting it down on paper, so to speak. I'd love to hear what you all have to say about it, and how you see abstraction in your own art. Busy weekend! On Saturday I dyed a jar full of fabrics -- via the parfait method -- most of which I had folded, scrunched or tied for shibori. I used some "new" fabrics (meaning, never been dyed before), some previously dyed ones, and some old linen pieces, doilies, etc. that I've been buying for a song at a local antique shop. 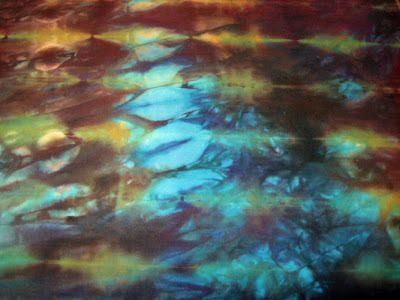 The piece above is raw silk, dyed for the first time this weekend. 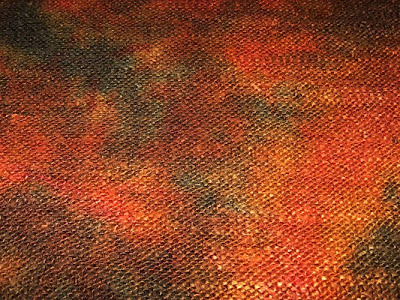 This piece is an old linen napkin that I'd dyed in a previous parfait batch that I had actually liked, but there were massive dye freckles on it originally. 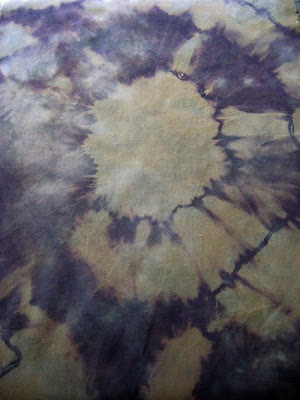 It was previously dyed a golden brown, now overdyed with purples and blues. 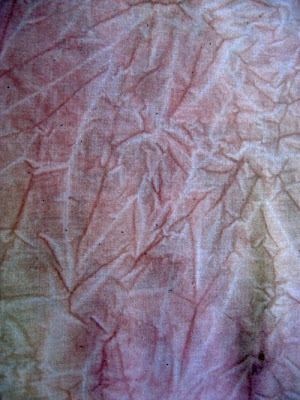 This is a piece of muslin, dyed for the first time. 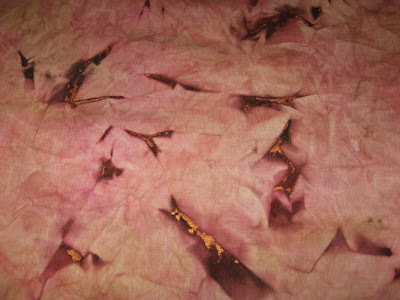 This is a piece of muslin that I'd dyed about 10 days ago in a golden yellow color. I had dyed it specifically for a quilt I'll be finishing this week, but there wasn't enough color mottling so I used something else for the quilt, and overdyed the fabric this weekend. One of my favorites of this batch, another piece of muslin. 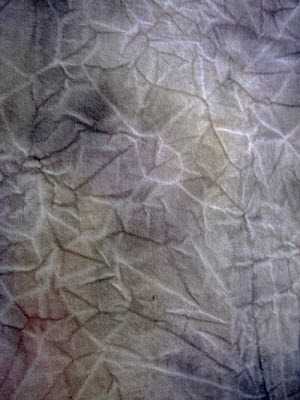 This was a piece of bleached muslin, I think (which I only used once and won't again) that I had shiboried months ago. It was mostly white with pale olive green areas. Now it's mostly lilac! Those undulating purple lines are interesting, I've never achieved them before. This is a fat quarter of muslin that I pole wrapped and stuck in the jar. Looks like it's been dyed twice but it was just this once over the weekend. Today I'm finishing up an experimental abstract quilt I worked on over the weekend. Another personal challenge, I guess you could say. I'll say more about the whole abstract thing when I upload that little quilt. Another month, another photo of Italy to inspire a quilt -- this one from a walk in the hills around Bellagio, another stunning town on Lake Como. 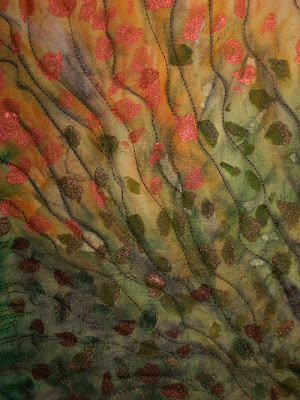 I've named the quilt Autumn in Bellagio, and it is 20x16 inches. 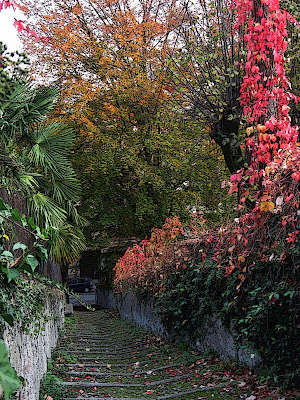 We had walked up these steps on our journey, and I turned around and shot this photo before continuing on. 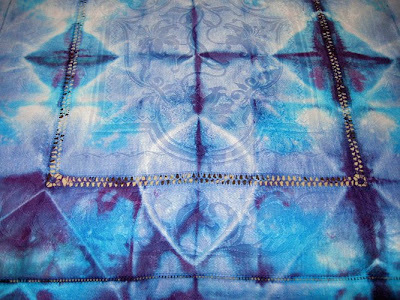 After the top was stitched together, I used different rubbing plates with Shiva Paintstix to add detail. The base fabrics were jar dyed, shiboried and printed. I have something completely different for the second iteration of this photo -- I'll have that completed by the end of the month. Meanwhile, the second monthly collage quilt is ready for me to quilt and finish next week. Another blogging friend mentioned on her blog yesterday about Blogger now having Page capability on their blogs -- you can check out the two Pages I set up yesterday on my blog home page, on the left right under the title banner! I completed my communication quilt today, for Fiberactions' second challenge...but you won't get to see it until March 15. I'm really happy with it, think it might be my very best quilt so far! 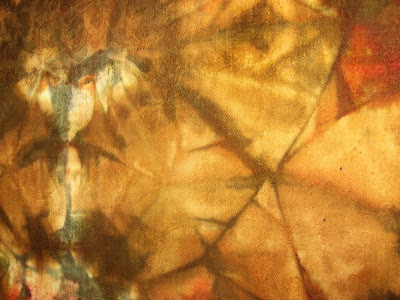 The photos here are samples of experiments I've been doing with Dynaflow textile paints, and I think I'll be doing a lot more of this. I've been scrunching up fabric, putting it in a small container so it holds the folds, and applying watered-down Dynaflow to the peaks of the fabric. Letting it dry, and then ironing to set the paint. The photo above has Lumiere applied to some edges after the paint. I'm really intrigued by the possibilities with this technique. 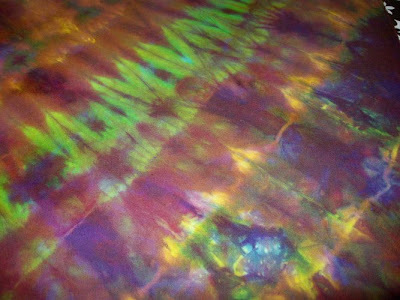 I've been experimenting with different amounts of moisture in the fabric to see how much color bleed I get. I could also stitch the folds, but I'm trying not to use my hands unnecessarily these days! I'll upload more photos as they're available. 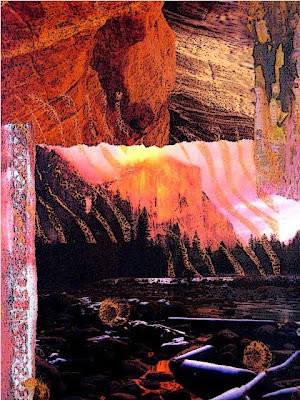 This is my first of two collage quilts for February, called Mountain Sunset. And as I decided to do late last month, this piece is 20x16". I like this size a lot better than working 16x12, feels more substantial. 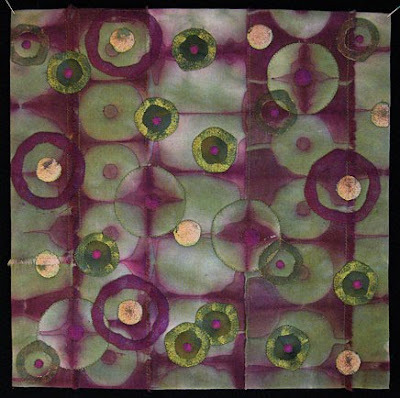 This is the original collage, also printed on linen and used in the quilt. I find myself at a loss for words right now, so I'll sign off. I might have uploaded these photos earlier in the week, but my hands and wrists are bothering me big time, so I've put this off until this morning. Over the past week I low water immersion dyed repeatedly, trying different things each time, working on perfecting my method. The most critical thing I've found, is that you need to batch for 24 hours, or at least overnight. There are countless procedures floating around out there that say you can achieve good results in 2 hours or less, but in my humbling experience, it's just not true. 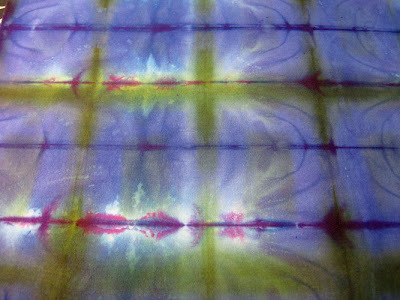 So now that I know this, I've been overdyeing a few pieces in more recent sessions. 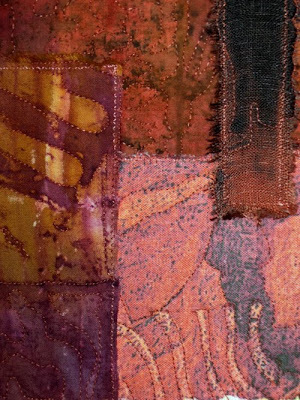 The two pieces above are from a parfait session, using rusts, deep orange/red, and browns. 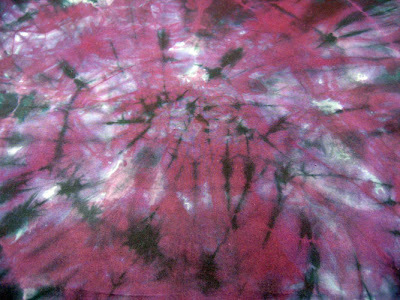 The first piece is overdyed muslin, something I originally dyed last weekend that turned out way too pale for my taste. The piece just above is really stunning -- it's 100% silk, handwoven by me from yarn samples I had from my supplier in Bangalore. I had tried rusting it last year but because the fabric is so thick, the rust process didn't work measurably. I decided to throw it into the mix this week and here's what I got! It has "slow cloth" written all over it! The last two pieces are from the first session that was batched for 21 hours -- and I like these, although I'll change my process somewhat next time so the results suit my taste even more. So there you have it. Have a good weekend. I'm hoping to start quilting on the couple of pieces I have ready to go. Although I've been in a designing mood all week, so I'll likely carry on blocking out another couple quilts for this month's challenges. It's just the first of the month, and here's Circles #2, February's entry for my 12x12" circles challenge. This one will get a frame later in the week. 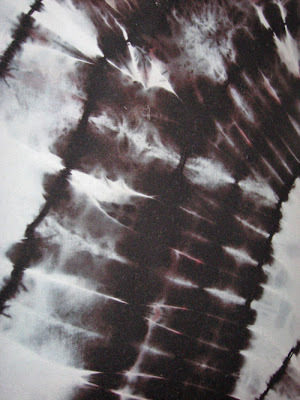 The fabric is an interesting piece of muslin that I shibori dyed last year. I tore off strips of the best circle impressions and laid them on top of the background, and then I added some circular pieces of fabric from elsewhere on the original fat quarter. I've been dyeing up a storm for three days straight but won't post any photos until late tomorrow. I'm still working on getting the results I want -- depth of shade and quality of patterning. There's such a learning curve with fiber reactive dyes...I've been at it for over a year and I'm still endeavoring to perfect a method that works for me consistently and produces the results I want. 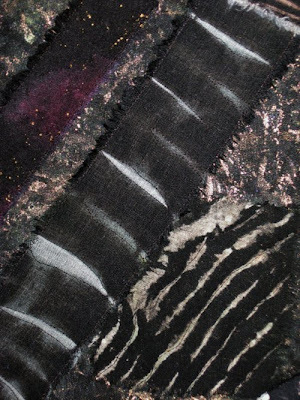 Today I started working on Fiberactions' Communication quilt, due to be revealed on March 15. I'm pretty excited because I love the fabrics I'm working with and I think the quilt is going to be really cool! I've also got a stack of fabrics selected for February's first collage quilt -- and I'm jumping these pieces up to 16x20 from last month's 12x16. I don't like challenges to be too easy -- then they're not a challenge!